So far ALL the Dem candidates have co signed or publically supported the AOC Green New Deal . Running on a pledge to eliminate fossil fuels in 10 years? Trump can only hope and be so lucky . Here is the plan ;a socialist takeover of America supported by the belief in unicorn logic . and here is the summary that AOC eventually scrubbed from her web site. Well Tom I guess you have dug yourself out from the latest impack of climate change, I think the US needs to go back to their universal income plan, (remember Lyndon Johnson) because once these lunatics destroy your traditional base of employment there are going to be a shortage of park benches. I would say that once the bill for all of this becomes more public, then voters will see it for the delusional idea it is, but then I remember we are 22 tril in debt and I lose any confidence in the American voter. I am convinced that a majority of voters no longer vote on issues but on how a candidate makes them feel. When I look at AOC, it makes me glad I am not a democrat. No worries guys, the people spoke in the last election, and will speak again in the next one. Green jobs have many benefits and while you can boohoo the science all you want the young folks are down with it, since they will be the ones paying for it, and breathing the air and drinking the water. It's the future folks, and since fossil industries cry about not investing in the technology to clean up their own mess because it cost too much, somebody has to step up and find a better way, and you may as well stop beetching about it, since you turn a blind eye whenever repubs come along and want to waste dollars on stupid stuff like walls on the southern borders and yet again enriching the rich with tax cuts that benefit them permanently, and us for a very short while if you call those slow trickling crumbs a benefit. Face it, repubs are screwing up again and the dems have a big clean up job to fix it. show me the science that says we can replace fossil fuels with renewable in 10 years . They talk of the moon landing ;but we already knew we could get out of Earth's atmosphere and all that was needed was a bigger rocket (which was already in development long before there was a NASA ) ; life support, and a landing craft . All that we knew was doable before Kennedy's proclamation. Nobody can tell you how to consistently fuel a modern economy with renewables . The only one that is half way reliable is hydro power . You know how the Robert Moses plant on the Niagara river generates power ? It takes half the flow of the river that goes over the falls at night ,and moves it to a giant reservoir so it can generate power during the day . That is why if you go to see the falls at night ,it appears that less water is going over them . The proposal calls for the elimination of gas powered autos . That would mean replacing them with battery cars and rail. But you know there is not enough power in renewables to mine the rare minerals to make the batteries that electric cars use . And the batteries have to be charged which means all you are doing is transferring the carbon source from the tail pipe to the smoke stack. You will never be able to generate consistent power with renewables . They are at best more expensive redundancy . Come on man! The place I work has over 500 truck coming and going a week to deliver goods and ship out product we produce .Do you really think that a trailer hauling 20 -40 tons of goods can be powered by electric battery ? This is such a bizarre ,believe in unicorn fantasy . Come back to me when you find a source of dilithium crystals for the warp drive ;or someone invents the flux capacitor ..... OR more realistically , creates a fusion generator . Oh wait ;nuclear power ;the only safe ,clean and reliable source of energy outside of fossil fuel, is going to be phased out in the plan . Brilliant ! You may be partly right, but as I watch cities, especially mine convert those carbon spewing buses and city vehicles to cleaner gas, and invest in infrastructure for rail expansion, there must be something we can do to modernize and transition from yesterdays technology to today's, so no one is chasing unicorns and maybe those 500 trucks you see everyday can be converted to a cleaner fuel, until we get those dilithium crystals, or cold fusion technology. OR A BETTER BATTERY. Who cares how much water goes over the falls if it produces the power to run stuff that doesn't have to spew stuff in the air or make humans dig in the dirt and get cancer. Incremental steps dude, not leaps and bounds is the history of man. What's wrong with that? nothing ... but that isn't what is proposed in the GND . What is proposed is draconian measures based on delusion. The very same thing that Stalin did to his country ;that Mao did to his ,that Chavez and Castro did to theirs . The difference is that those dictators of the past didn't have free elections as we do, or the acceptance of opposition that we have. So don't compare us to them. It ain't the same no matter how hard you conservatives try to make it the same. It's no wonder you are afraid of any new ideas and make them bogey men to your own notions of freedom. AOC for PRZ in 2032! Green jobs is an opportunity with great benefits. Foolish not to grow an already growing money tree. Who gets hurt.. Here is what is wrong with your argument. To fund green jobs with federal funds, money has to be taken from one person and then given to another, all with the typical waste of the fed government thrown in. It is a ludicrous idea, about on the level of thinking that taking money from your right hand pocket and putting it into your left hand pocket somehow makes you wealthier. It's just another wealth transfer proposal that is dressed up as economic policy. remember all those green jobs we payed for under the emperor's reign that went belly up ? The Energy Dept shelled out $35.2 billion for green jobs . econ­omy, but we never thought they’d be this can­did about it. Yeah boy. We sure need to go back to the glory days of B. Obama. 10 tril in debt to go along with all of the above. I thought this was kind of funny. 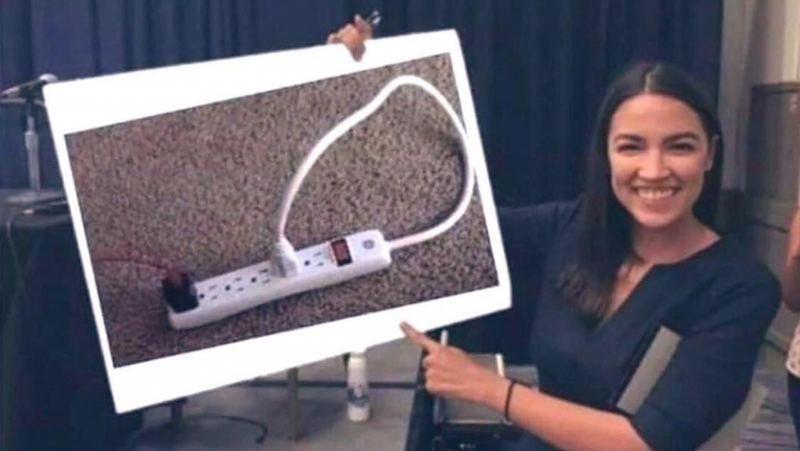 It was captioned as AOC's plan for free electricity. Pretty good JL, you got a chuckle out of me this morning. Actually the green network has expanded in jobs and technology. Despite the Solyndra scandal and the failures of others the program that guarantees capital under Obama has done fairly well and highlighting just the failures is a bit one sided since in the capitalistic world companies fail all the time, and get sold, bought out, absorbed, and incorporated by other companies. Tom says that's the American way. I just look at a bigger picture where green jobs and technology is growing and that's an undisputed fact and scrapping that model for a rapidly shrinking industry just makes no sense. I know fossil fuel plants balk at the expenses they would incur adapting brand new clean air technology, and push back against the cap and trade idea as helping the competition, but the truth is the market is crying for and investing more in clean green technology now more than ever before. Maybe you and Tom don't see that but I certainly do in my RED state, that has been an oil icon forever. Look around and get with the program and get the facts of what's been done since 2005, and you may realize there are more winners with green than losers and the numbers from the energy department bear that out. in the capitalistic world companies fail all the time, and get sold, bought out, absorbed, and incorporated by other companies. Tom says that's the American way. What Tom also says is heavily subsidizing them is not capitalism. I know fossil fuel plants balk at the expenses they would incur adapting brand new clean air technology, and push back against the cap and trade idea as helping the competition, but the truth is the market is crying for and investing more in clean green technology now more than ever before. That is not in the NGD agenda . The agenda is to eliminate fossil fuels in a decade . It is delusional . Horizontal drilling has made untapped reserves more available than ever before . It is by far the most important breakthrough in energy in our life time . Back in the day your oil wells burned off natural gas because they did not know what to do with it . Now natural gas is the best source of fueling a 21st century economy. All those thousands of windmills that blight the landscape in your state are at best more expensive supplemental sources of power. Wind power just fails to deliver 100% of the time . What do you do when the wind doesn't blow ? Blackout ? No Because all your windmills are backed up 100% of the time with fossil fuel generators . And it takes CO2 emissions to even build a windmill . Even before the blades start spinning ; the average wind farm clocks up thousands of tons of CO2 emissions: in thousands of tons of steel and concrete. . Making steel ,aluminum ,concrete takes heat ......lots of heat . Renewables except biomass cannot be burned .So how is your windmill going to power a steel plant ? here's one solution .......self generating renewable energy . By your own statements if it cannot produce 100% then don't do it? I know that's not what you meant nor a reason to stop improving on the green technology. For now, yeah we need a back up plan. It's like this Medicare for all will destroy insurance companies, which is far from truth and hasn't happened anywhere in the world as far as I know, and indeed Medicare in America as it is still requires a supplemental secondary insurance to cover the 20% MC doesn't. Human ideas are at best limited and adjustments always can be made, but for NOW, we should continue to explore options that lead to better outcomes. Even Steelmakers recognize that. but for NOW, we should continue to explore options that lead to better outcomes. You do realize that the NGD goes about a thousand times farther than simply exploring options? I am all for exploring other ideas. As for green energy, if it wasn't for government subsidies, there would not be a single wind generator in America. It is much more expensive electricity than from conventional plants. Tom's comment's about the necessity for keeping fossil fuel plants was intended, I think, to illustrate how ridiculous AOC's idea for eliminating fossil fuels is. It is totally in fantasy land and shows she has no sense whatsoever. It should be alarming that someone like her is trying to make serious economic proposals. It should be far more alarming that every dem candidate for president has endorsed her terrible idea. Does anyone else think it is kind of awkward timing that one week after the NGD is proposed with its call for high speed train networks, California cancels its plan for a "bullet train" due to out of control costs? Ooops. I am married to my wife for five years. After three years of marriage file for my green cad . I got my premanant green card in march of 2009. I have a child outside of marriage and my wife found out. She put me out the house and said she is going to revoke .